Check out Savoring Saratoga's blog post about the Saratoga Food Tours. Saratoga Arts has announced their 2012 workshop series. They are all free and open to the public, and include topics like making slide presentations, copywrite and intellectual property, grantwriting workshop, and gallery submission process. Click here to learn more. The Saratoga Farmers Market has a new Saturday vendor - Slyboro Cider House. This isn't Hannaford mass produced cider, these people take it to a new old level: Still ciders, sparkling ciders, ice ciders...Slyboro Cider House reintroduces the lost craft of American Ciders." Cool! I hope they have samples - I would like to try the ice ciders. They sound sweet. Click here for the May newsletter for Longfellow's and the Olde Bryan Inn. Maestro's is celebrating a year at the new place. Check out their party on Monday May 21. I'm a little late, but check out local blogger Tom Noonan's comments on the Kentucky Derby, and be sure to look for his analysis on the site before the Preakness. Every Tuesday get two wood-fired pizzas or stuffed focaccie breads to-go for just $12. Add a 1/2 Tray of Forno’s Classic Mista Insalata for just $6 more. Join our email list or Facebook page to find out the featured pizza or focaccie ahead of time. Sticking with DZ Restaurants, if you like on Facebook their newest and yet-to-be-opened Restaurant, Boca Bistro, you can win a $500 gift certificate. Not to show favortism to just one ethnic restaurant group, so Capriccio Saratoga has Skip Parsons performing every Thursday in May and is offering any pizza on the menu for $13. Don't forget The Wine Bar has some nice Monday night specials. I see the third annual Saratoga County Restaurant Week goes this year from March 16-25. For $20.12 you will get a three-course dinner at more than 40 participating Saratoga County restaurants, many right here in the Spa City. When this first started in 2010, there were very few Saratoga Springs restaurants that participated, but that changed starting last year. I pointed out last week that Mayor Scott Johnson made the right call on the South Side Rec center, and I was happy to see the Mayor mention South Broadway's problems in his recent state-of-the-city address. The only problem is that I was pointing out these same problems over a year ago. The city Democratic Committee recently wrote an opinion piece in The Saratogian accusing His Honor of having no vision, being slow to react, and certainly not being proactive. With the aforementioned Rec Center being the lone exception, I couldn't agree more. Speaking of failing to be proactive and lacking foresight, I haven't heard much lately about the dangerous traffic situation on South Broadway. Did NY State DOT go back to sleep? I certainly hope I'm wrong, but I just have a feeling there is another awful accident pending on that deadly stretch of highway. I don't know if I'm a subscriber, member, customer or what of Groupon, but I've recently signed on and have noticed there are not too many offerings for places here in the Spa City. Most offerings seem to be centered around Albany. There seems to be quite a buzz about the Brad Pitt movie about Solomon Northrup. That's great that this historical figure, who certainly had an amazing life, will be getting his due on the big screen. I just am not expecting a shot in the arm for the local economy from it - there are no indications that any of the filming will be done here. In fact, why would they film here? It would be very costly and there isn't a whole lot left, as far as buildings and such, from Northrup's time in this region. I'm not saying this won't have some positive effects for our region; I'm just not expecting those effects to be significant. Well, Van-Halen is coming to the north, south, east, and west of Saratoga on this spring's tour - namely Montreal, NYC, Boston, and Buffalo - but no SPAC. Well a SPAC show could have been a mess, with all sorts of crazies, but I would still like to see it. I'm hearing word that the Oklahoma Track may open early this year. Well that would be a good thing - and would be something that could give the local economy a shot with horse owners and trainers moving here that much earlier. If this is true I'm assuming it means 2 or 3 weeks early, meaning a very late March/early April opening. The buildings there aren't winterized, so I couldn't imagine how they could open up any earlier. How sad that Saratoga's own Tuskegee Airman Clarence Dart died a few days ago. At least he was able to see the movie Red Tails, and he even received a standing ovation when introduced at the Wilton Cinemas' debut of the movie last month. His death is sad, but I'm very happy that he at least lived long enough to receive honors from the President, Congress, and Hollywood, and knew before he died that neither he nor his fellow Tuskegee Airmen would ever be forgotten. February is almost done and Saratoga Springs organizations are talking summer. SPAC recently announced the lineup for the 35th annual Freihofer's Jazz Fesival on June 30 & July 1. The Oklahoma Track is opening soon and we're talking about summer concerts. Life is looking good in Saratoga Springs! I'll end with this link of a reporter writing about a chance meeting with Whitney Houston here in Saratoga Springs in the late 1980s. Perhaps it was the same time she was performing at SPAC in 1987 that this Youtube video below shows. The late singer sure gave an energetic performance of "I Wanna Dance With Somebody" that night, and the crowd was jumping and the place was rocking. They sure got their money's worth from Ms. Houston that night. That's it for now folks. Have a great week! I've said it before and I'll say it again, the South Side Rec Center is a great asset to our city and I will give Mayor Scott Johnson two thumbs up for his decisiveness and leadership on getting that place built on an underused park site. Don't get me wrong, I'm not a fan of The Mayor, but he made the right call on the rec center. The You Idiot blog has become a great source for rumors, many of which turn out to be accurate. The latest rumors he is reporting on, and again these are just rumors and not confirmed, is that Virgil's House and Pizza Works, both on Henry Street, may be closing. He also is reporting an unnamed popular NYC eatery may be opening in the Bonacio Price Chopper building. He also showed a picture of a sign announcing the new beer garden on Broadway - which is news I believe he originally broke as well. I was out with a few friends last night at Cantina and the Franklin Micare duo was rocking the house. They had the place jumping and it was really an enjoyable show. It's good to be in a bar and not feel like you have to be 22 years old, and it's also good to see Franklin Micare still in town on Saturday nights now that the Grey Gelding is long gone. Bed and Breakfast update: The Batchellor Mansion Inn price has been lowered again, to $2.9 million, and the Westchester Inn is not only for sale, but also for rent at $3,500 a month. Hmmmmm. Congress Plaza could use a dollar store. It just seems right. Besides, what else is going to move in there anytime soon? In a post last month I noted The Saratogian had well-written editorials, but that there were too few of them. I encouraged our hometown daily to write more of these opinion pieces, suggesting a goal of two per week. The Saratogian acknowledged that post of mine in a tweet of their own, and since then there have been editorials written consistently every Sunday. Although short of my suggested two a week, these Sunday editorials have been comprehensive, well-written, and well researched on topics of high importance to Saratoga Springs. Today's editorial, about the numerous empty buildings on South Broadway, also had numerous pictures of the several vacated premises along one of the key our gateways to the city. The editorial was laudatory of the city's efforts in some respects, but encouraged the city officials to cooperate and communicate more - it noted there were two different plans that were seemingly created without inclusion of all officials. It's good to see The Saratogian as an advocate for a reasoned and apolitical approach in fixing some of the city's problems, and I look forward to a continued effort in that role. Although I somewhat agreed with the Saratogian's point (above) regarding the need for cooperation and communication, I nonetheless applaud Supervisor Matt Veitch and City Council Member John Franck for trying to take some action on South Broadway. I appreciate their initiative and effort; let's hope they can make some headway on this. And I'll finish up with a roundup of links with updates on various Saratoga businesses and organizations: Universal Preservation Hall, Saratoga Olive Oil, Longfellows and Olde Bryan Inn, Saratoga Arts, Maestros, Sloppy kisses, DZ Restaurants, and Saratoga P.L.A.N. Ok folks that's it for now. Have a great week. I am hoping to see the movie Red Tails - partially because it is a WWII movie (my late father, Ted De Federicis, was a B-24 Bomber co-pilot during the war) and partially because a Saratoga Springs resident was one of the Tuskegee Airmen. That is so awesome. If anyone has seen it please post a comment on here. I was glad to see the Rail, Ski, and Stay package offered utilizing Saratoga Springs hotels, restaurants, and shops. I hope it is successful - although I imagine this winter's mild weather isn't exactly helping. I wrote a few weeks ago how the T-U lost interest in their Community Blogs, and now I see the Post Star's Saratoga Snippets blog hasn't been updated in almost two months. Not sure what's up with that but I may give reporter Tom Dimopoulos a quick email to inquire. It looks like Maestro's is starting a monthly newsletter announcing specials and other offers, such as their Valentines Day menu. Their February issue can be found here. You Idiot is reporting on a few rumors, one being that the former Brindisi's location will be filled by the restauranteurs who also own Russo's Grill in Amsterdam, ADDED: The Saratogian has the details here. Also another post by You Idiot indicates, amongst other things, that Sangwych "is in serious trouble", Bowtie Theatres are moving into the old Borders location, Max London will be appearing on the Food Network Show "Chopped", and a Spanish Restaurant will be moving into the old Grey Gelding location. Again these are rumors, and the last one (Grey Gelding) could have been mixed up with the confirmed news, of which I reported part of on last week, that the Zecchinis (owners of Chianti and Forno Bistro) will open a Spanish Tapas Restaurant in the old Pizza On Broadway location. You Idiot has his ear to the ground so I'm sure more than half of what he reported on is true. Just not sure which half. 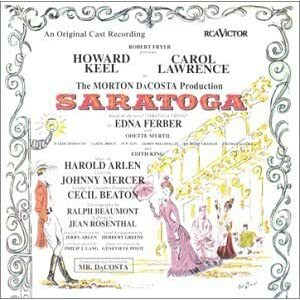 Did you know that there was a Saratoga Musical? It was on Broadway in the late 1950s, but didn't do so well. You can buy a poster from the play from someone on Amazon.com. I know the Saratogian has assured us that the sale of their Lake Avenue building was just a simple "internal transaction", but I'm reserving the right to let it get me nervous for reasons I can't exactly articulate. I'm pretty pissed off to find out how quickly the Genting Corporation, the ones who run the Casino down at Aqueduct, is apparently willing to jettison the horse racing at Aqueduct so they can knock things down, kick everybody out, and build a huge convention center, hotels, and an even bigger casino. Maybe I was a bit naive and my love for horse racing blinded what should have been obvious. Genting looks more to me like a wolf in sheep's clothing a Trojan horse (pun not really intended) than a savior. I'm not against a Convention Center there, but does that really mean they have to end horse racing too? Why can't we have a gigantic and unique convention center, one with something special in addition to the mundane slot machines and table games? I see the Horse Racing Museum and Hall of Fame is closing until March 1st for some "exhibit updates". I don't doubt that is the reason, but something tells me the slow winter months likely influenced their decision to stay closed for a little longer than they may have otherwise. Saratoga General Music Rule #I - if you're a national act playing at SPAC, your career is doing quite well. Saratoga General Music Rule #2: If you're a national act playing at Vapor Nightclub, you haven't had a hit in 15 years. And finally, the best happy hour in Saratoga Springs? The Turf Club, at least according to some of my friends. I was there once recently and would tend to agree, if for no other reasons than the warm fireplace and the neighborhood feel. That's all for now folks, have a great weekend.